Rated 0.3 A, 24V, AC or DC. Ball: Silver Plated. Lead Length:15 mm (9 /16 "). Switching capacity (max.). A robust, fully sealed tilt switch, manufactured using non-toxic materials in an ABS case. Switch operates when tilted from the horizontal position. Suitable for a wide range of applications. This module is ideally suited to adding a slightly different trigger switch to your project. This module provides a tilt switch in a mountable module. Tilt ball switch. Main Colour Pin pitch The tilt switch contains a free mass that is able to provide a change in output depending on the oreientation of the module. EXAMPLE: WARNING LIGHTS MOUNTED IN REAR DOOR/HATCH WHEN OPEN LIGHTS WILL. Keyes Tilt Switch KY-040 Easy Ball 5V Arduino Raspberry Pi. Pin pitch Main Colour Ball switch. This module is ideally suited to adding a slightly different trigger switch to your project. This module provides a tilt switch in a mountable module. Keyes Mini Tilt Switch KY-020 Easy 5V Arduino Raspberry Pi. Pin pitch The tilt switch contains a free mass that is able to provide a change in output depending on the oreientation of the module. This module is ideally suited to adding a slightly different trigger switch to your project. Vandal Resistant - Illuminated - Heavy Duty - Miniature or Sub Mini. letting us know you are satisfied with it. Used as a tilt sensitive switch for circuits, including use with Arduino. Material: Mixed Alloy. Switch Size: 12.9 x 5.2mm. Maximum Current: 100mA. Main Colour Pin pitch This module is ideally suited to adding a slightly different trigger switch to your project. This module provides a tilt switch in a mountable module. The tilt switch contains a free mass that is able to provide a change in output depending on the oreientation of the module. Ideal Low Cost Solution in Alarm Systems and General Angle Sensing. Differential angle: 10°. Great range of products. Everything you need for your Electronics Project from one supplier. This does not affect overseas orders. During that process you will be issued with an RMA number. 2VA switching capacity. LC Technology. Tilt ball switch. This module is ideally suited to adding a slightly different trigger switch to your project. This module provides a tilt switch in a mountable module. Main Colour Pin pitch. LC Technology. Tilt ball switch. Main Colour Pin pitch This module is ideally suited to adding a slightly different trigger switch to your project. This module provides a tilt switch in a mountable module. Keyestudio EASY-plug Tilt Switch KS-115 Easy Ball 5V Arduino. This module is part of the Keyestudio EASY-plug range and features the series standardised connector. Further more the socket is compatible with all readily available standard RJ11 ended cables. Main Colour: Clear, Silver Tone. (4) We attempt to send out all orders received before 3.00pm. We only accept cash on collection. 2, The product when the tilt angle is greater than 15 degrees, in order to turn ON,when the product is tilted to change the level of the state, the trigger-side below the level of greater than 15 degrees inclination angle, in order to open OFF state. Switching current: 25mA max. Case material: copper alloy, gold plated. Outstanding pricing and great value for money - keeping your project costs to a minimum. Great range of products. Everything you need for your Electronics Project from one supplier. 5 XNewSW-520D Vibration Sensors. Double bead ball. The switch would be in the “off position” in the horizontal positon, “on positon” when raised to 10-90 degree or shakes. Sensitivity Range: >± 15 Degrees. Single gold-plated pin, with a lead attached to the case. Glass bodied switch in a blue ABS housing with slotted fixing holes (39mm F.C.)Max. carrying current 2APrewired with 300mm of 2 core PVC cable. Vibration resistance varies with the intensity of vibrations. Get In Touch. SW-420 normally closed. Closed resitance : <10 Ohm. Current : <20mA. Open resitance : >10M Ohm. Double bead ball. Sensitivity Range: > ± 15 Degrees. 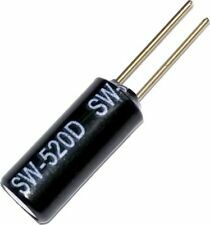 Part No: SW-520D. Type: Normally Closed. Maximum Current: 5mA. The switch operates when tilted from the horizontal position with a differential angle of 15°. switching current: 1.0A Max. switching capacity: 25VA Max. 150mm L Comus type S1016CW / BLU 800-587 RoHS compliant. 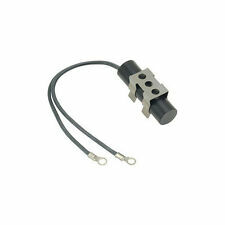 DURAKOOL A-1 Series - A1-003 Tilt and Position Switch. Switching occurs when Body Axis is Near Horizontal. Included Angle: 15 Degree. 4 amp resistive DC 5 amp resistive AC Max. G5Z-002 Tilt Switch by DURAKOOL. Condition is New. Shipped with USPS First Class Package. We have a feeling that it works when still not when it moves from side to side. sorry we do not have much data on this part there are 2 connections in the middle and one on the case. NEW, AS SEEN ON PICTURE!